The Key (aka Pecos) is a gorgeous smoky creme Welsh Pony stallion, section B. Tested by UC Davis to be true-breeding for a black base color and double dilute (i.e. he’s of genotype E+E+ AaAa CCrCCr). He will produce only buckskin and smoky black foals when bred to solid (base) colored mares. 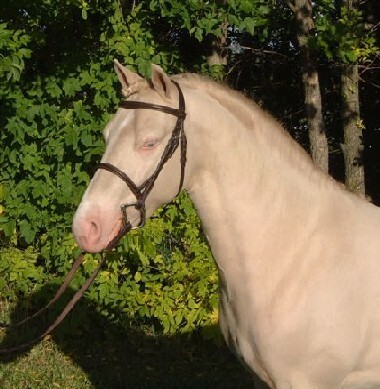 His owner describes Pecos as having “a wonderful personality and willingness to learn”. Thanks to Shirley and Eric Brand of Alberta, Canada for sharing this photo with us.